The Boston Children’s Theatre is set to present "Miss Nelson Is Missing!," based on the popular children’s books by Harry Allard and illustrated by James Marshall. Adapted as a musical by Joan Cushing, performances will take place from February 20 - 28 at The Grand Lodge of Masons of Massachusetts. The production will also tour to the North Shore to perform at Endicott College on March 8 and 9. 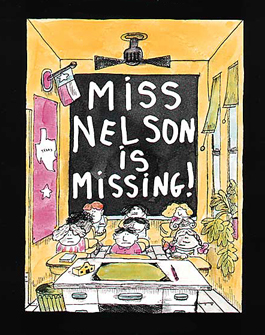 In "Miss Nelson Is Missing!," the misbehaving kids in Room 207 at Horace B. Smedley Elementary School take advantage of their teacher's good nature until she disappears and they're faced with a cruel substitute. How will the kids solve the mystery of Miss Nelson’s disappearance and get their wonderful teacher back? As with all BCT productions, the cast is made up of talented local young actors including: Rosie Cerulli, 12, of Boston; Jacob Cofer, 11, of Tewksbury; Natalie McPherson, 11, of Somerville; Joseph Nedder, 9, of Westwood; Kevin Paquette, 17, of Charlestown; Sam Payne, 14, of Brookline; Alex Pecoraro, 15, of Hamilton; Dierdre Pederson, 11, of Westborough; Michael Perotto, 19, of Boston; Brion Rock, 17, of Boston; Joanna Rosen, 13, of Marblehead; Katie Ryan, 10, of South Hamilton; Ashley Ryan, 12, of South Hamilton; Linnea Schultz, 12, of Methuen; Channing Shippen, 20, of Boston; and Parker Joy Williams, 10, of Brookline. In addition to its stage performances, "Miss Nelson Is Missing!" complements teachers’ curricula in a variety of educational connections, including music, language arts, relationships and family. Teachers and school administrators are invited to contact Boston Children’s Theatre for curriculum guides for each production. Boston Children’s Theatre was founded in 1951 as a stand-alone, non-profit organization, dedicated exclusively to young people and the telling of their stories. BCT ranks as one of the oldest children’s theatrical organizations in the United States. For information and tickets (or to learn more about BCT classes and programs), call 617- 424-6634 or visit www.bostonchildrenstheatre.org. Tickets are also available through www.theatermania.com.